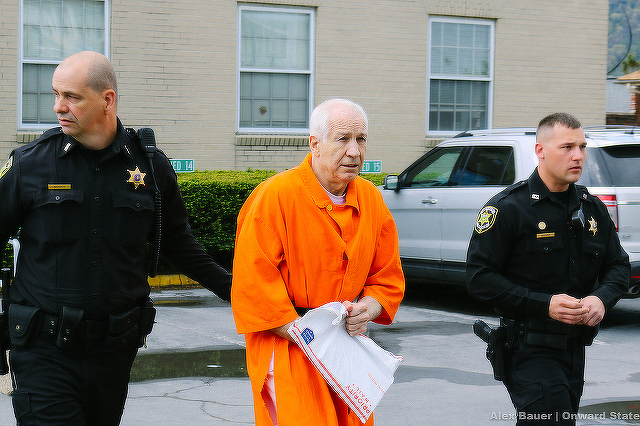 Jerry Sandusky outside the Centre County Courthouse in Bellefonte on May 2, 2016. A Pennsylvania Superior Court panel on Feb. 5 denied Jerry Sandusky a new trial but ordered that his sentencing be vacated and a new one be imposed. The 75-year-old former Penn State assistant football coach was sentenced in 2012 to 30-60 years in state prison after he was convicted on 45 counts related to child sexual abuse. In a 119-page opinion, the three-judge Superior Court panel unanimously ruled in Sandusky's post-conviction appeal that the lower court's sentence improperly imposed mandatory minimum sentences. The opinion cites two Supreme Court decisions that found mandatory minimums to be illegal when elements of a crime that would give rise to an increased sentence are not presented to a jury and found beyond a reasonable doubt. Sandusky had raised 21 other issues alleging ineffective counsel by his trial attorney, Joe Amendola. In its opinion and order, the Superior Court panel considered each and did not find grounds to order a new trial. "Accordingly, we affirm that part of the PCRA court’s order denying a new trial, but we vacate the judgment of sentence in its entirety and remand for re-sentencing without imposition of mandatory minimum terms," the Superior Court ruling stated. The case will be returned to the Centre County Court of Common Pleas for the new sentencing. Specially-presiding judges were assigned to the case in the Court of Common Pleas, most recently with Jefferson County Judge John Foradora denying Sandusky's PCRA request for a new trial in 2017. Sandusky's post-conviction attorney, Al Lindsay, said in a statement on Tuesday that he would continue to appeal to the Pennsylvania Supreme Court. “In doing so, the court has an opportunity to correct one of the most profound injustices in the history of American Jurisprudence," Lindsay said.